Before she got angry, local artist Elizabeth Berry’s watercolor and oil paintings reflected snapshots of stunning colour and pastoral beauty around the world. Vivid poppy fields in France. Pretty East Coast fishing coves. Strutting, scarlet-crowned roosters in the Carribean. But then came the morning after the Victoria Day long weekend in May. Her regular, early morning walk on the waterfront brought her to a scene on Woodbine Beach that got her so mad, she immediately beetled back to her home on Neville Park Blvd. (a 6.5-kilometre round trip), picked up her paint gear and returned to the scene of the grime to immortalize what she saw. It’s evocatively titled Woodbine Beach Litter, a 15-by-22-inch watercolour that took her about four hours to create on site, with a return trip the following day at which she added one of the litter’s few fans, a seagull, and waves. says Berry, whose acclaimed paintings have been sold around the world, four of them recently acquired by Queen Sonja of Norway. The garbage depicted in the painting — pizza packaging, coffee cups, pop cans, cigarette butts and more — was all real and on the scene — and repeated in various clumps throughout the beach. It’s nothing new, but it’s getting worse, says Berry, who’s in her late 60s and walks the boardwalk every day. She sees all sorts of litter — from food-related to personal, like abandoned diapers — continually along the route, although the quotient goes up as soon as the good weather arrives and stays high until after the Labour Day weekend. But that particular day seemed to be worse than usual, and it set her off. “I was so upset … I thought, maybe a painting can reach people,’’ said Berry, who says a painting she did of the Neville Park-area waterfront was part of a successful citizen campaign to stop a proposed waterfront condo project a few years back. It’s already inspired a small loosely formed citizen group concerned about litter on the Beach waterfront, which includes Beaches-East York Councillor Mary-Margaret McMahon. Berry says she’s also had T-shirts made (available for $20 apiece by emailing her through her website, www.elizabethberry.com), which feature her Woodbine Beach painting and include the words “pick me up at the beach.’’ After the costs of the T-shirt production are covered, Berry says she will donate the rest of the T-shirt money to efforts to educate people about not littering the beach. And anyone who wants to join the group is also welcome to email her. McMahon thinks the T-shirt featuring Berry’s artwork is a great idea. “This will attract attention. The ‘pick me up at the beach’ is a funky line,’’ which she says has a fun tone and will help engage people. But the litter problem itself is serious. “We’re appalled by the state of the beach, especially after festivals and long weekends,’’ says McMahon. The city has a grader machine that combs the beach daily during the summer and filters out the litter, along with hand pickers who go where the grader can’t and pick up garbage. But this uses up taxpayer dollars, says McMahon. “I don’t know what makes people think it’s acceptable to leave a piece of trash behind. Berry is also selling 200 limited-edition prints of her painting ($150, unframed), and the original is available for $1,250 (framed). Painter Elizabeth Berry has a keen eye for the colours of Woodbine Beach – she walks to it nearly every morning from her home on Neville Park Boulevard. But last week, walking the same shore where she once painted clean white surf and azure skies, the sight of a gull grubbing in a pile of picnic litter had Berry seeing just one colour – ketchup red. Berry has had several moments like that since the morning after the Victoria Day fireworks. The litter is always worst in the early morning, she explained, before the city’s parks department sweeps the beach and then has staff pick up any remaining trash by hand. On that particular morning, the trash was so thick that Berry finally answered a two-year-old dare from her friend and former Woodbine Beach Association president Ken Harvey to go ahead and paint the garbage. Despite hours of painting cigarette butts and fast-food litter in a chilly morning fog, Berry said she felt surprisingly happy. The result, a painting called Woodbine Beach Litter, made a splash in the Toronto Star and on CBC radio’s Metro Morning. Here in the Beach, the painting has made its way onto some 75 T-shirts, thanks to a coffee-shop meeting with Berry, concerned residents and Ward 32 councillor Mary-Margaret McMahon. Walking along Woodbine Beach last week, several morning regulars saw Berry’s T-shirt and stopped to give their support. Carri MacNeil took a moment before work to say she admired Berry’s painting for its spontaneity. MacNeil said most special events at Woodbine Beach, such as the volleyball tournaments, tend to be run by people who keep it clean. Angela Miller, the Woodbine Beach foreperson for Parks, Forestry and Recreation, also stopped by to chat with Berry about her painting. Miller said the garbage level is actually better in some places now than it was five years ago, when it was especially bad in the grassy areas towards Ashbridges Bay. But the litter was worse in May and June, she said, because for those two months the city had bins on the boardwalk, but none on the beach itself. The trouble is that garbage pick-up moved from the parks department to Solid Waste, and that department doesn’t have equipment to carry bins on and off the sand. In the end, park staff agreed to handle the beach bins for July and August only, when they are at at their peak use. Berry said the ‘Pick Me Uppers’ group is still in its early stages, but she hopes they can organize an awareness campaign for the next beach season. After travelling to many faraway beaches to paint – including some in the UK, France and the Bahamas – Berry said she has seen a few beach-cleaning ideas that might work here. On the Bahamas’ tiny Harbour Island, she said the town collects a stipend for a local bar owner who cleans the beach for a few hours a day. Someone with that sort of community support might get a better response when dealing with litterers than a bylaw officer or parks employee, she said. Another idea is the ‘Take 3′ campaign started in Australia – a public ad campaign that simply asks people to pick up three pieces of litter every time they leave a beach or waterway. One of the reasons why the Beach is such a great place to live is that, many times in its history, the community has come together to fight to preserve its character. The Beach fought (and won) to prevent highrises on Queen Street, dredging of the lakebed, and the Scarborough Expressway. Now there is a new threat slowly changing the community street by street – infill development that is inappropriate and out of keeping with the neighbourhood. On Sept. 25, a newly formed organization – the Beach Lakefront Neighbourhood Association (BLNA)– held a standing-room-only meeting at the Beaches Rec Centre to inform the entire area about a development planned for the foot of Neville Park. The association was formed by residents of Neville and Munro Park Avenues who discovered earlier this year that a developer (2107039 Ontario Inc.) has plans to build a five-storey condominium at 2/4 Neville Park Blvd. and 438 and 440 Lakefront Lane – right on the lakefront. In order to construct the building – which is far in excess of city height and density levels set for this neighbourhood – the developers (Gordon Kaiser, Dermot Sweeney and Neheel Suleman) have put in an application to the city for an amendment to the city’s Official Plan and local zoning by-law. The Neville Park neighbourhood has had several meetings to develop a strategy to fight the proposed condo, however the BLNA decided to hold this one to get the larger Beach community on side with their concerns. The BLNA believes that, if the five-storey condo is built, it will set a precedent for other lakefront development. The first speaker for the Sept. 25 meeting was Dermot Sweeney, one of the project’s developers. Sweeney said that he is familiar with the Beach, having lived on Queen and Fallingbrook for many years. The vision behind the condo, he said, was to allow “many families to share the site, because so much of the lakefront is owned privately.” The proposal submitted to the city calls for 16 units with 27 underground parking spaces, however, said Sweeney, the final configuration will probably be between six and nine, because potential buyers have expressed an interest in larger units. “I think money would be better spent on landscaping Neville and Munro, then going to the OMB (Ontario Municipal Board),” he told the audience. A number of people had questions for Sweeney – almost all hostile. He was asked if a redesign was possible, if more green measures could be incorporated, and how many city trees would be cut down (none, the trees are all on private property). He was also asked what the cost was for the smallest unit ( 2,500 sq ft ). His associate indicated that it would run in the $2.5 million range. Brian Bennett from the BLNA then explained how the association got started. Because the BLNA believes that the proposal will eventually make its way to the Ontario Municipal Board (OMB), one of its initiatives has been to hire planner Peter Smith for $10,000 to prepare an independent planning report. The city planner, Leontine Major, will be submitting her report to community council later this fall. Steve Ottaway and Dennis Woods explained the repercussions of the proposal saying that “if Sweeney wins [at the OMB], the whole neighbourhood is at risk,” because the city’s new Official Plan would no longer be able to protect and direct neighbourhood development. Councillor Sandra Bussin, who is on record as opposing the proposed development, said that “if this is allowed, I strongly believe that we will see significant change along the beach.” She pointed out that while the zoning bylaw has an upper density of .6, the developer is requesting 1.94 – three times that allowed. The proposed height of the building is 17.3 m, while the city only allows 12 m.
The most poignant part of the meeting came when a letter from Howard Bushnell was read. Bushnell was the owner of 2 Neville Park Ave. – one of the houses to be knocked down for the development. Bushnell explained that he had lived on Neville Park since the war, and when his neighbour (Gordon Kaiser) demolished the house next to him, “I vowed I would never sell to Gordon Kaiser.” The letter explained that a local real estate broker approached him supposedly representing a woman who wanted to purchase the home to live in. Only after Bushnell signed the papers did he discover that the purchaser was acting for Sweeney and Kaiser. “I was deceived,” said Bushnell. The high point of the evening was the announcement that Elizabeth Berry has donated her painting of the property in question to the BLNA as a fundraiser. Berry said she walks down the steps at the bottom of Neville almost every day, and that a condo like the one proposed would destroy the beauty of the waterfront in that area. Signed Giclee in three sizes are available for sale, and the original oil will be auctioned off at a later date. For information on acquiring a print or for information on the BLNA go to www.BLNA.net. Elizabeth Berry, a Toronto-based artist, has created four new paintings of cornflowers in full bloom and has donated them to ALS Canada and they will be turned into cards to raise awareness. The blue cornflower is ALS Canada’s emblem. Despite its fragile appearance, cornflowers are hardy wildflowers that grow across Canada. Like the cornflower, people living with ALS show remarkable strength in coping with a devastating disease. Like the cornflower, awareness of ALS and funding for care and a cure are growing across Canada. No stranger to making a difference, Berry’s paintings have been featured on ALS Canada cards in the past. Her prints also have raised money for Breakfast for Learning to help ensure that all children get a good breakfast. The Canadian Cancer Society used her daffodil painting for their annual fundraising fashion show invitation. Travelling around the world, Berry paints gardens, rustic houses, small shops and other inspirations in vivid and bright colours. Many of her creations feature scenes from around her hometown of Toronto and around Canada. In 1982, Berry won the Archives Award at the Toronto Outdoor Exhibition and subsequent showings earned her Best in Watercolour awards. Sonja, Queen of Norway, recently purchased four of Berry’s paintings. Berry’s annual studio show will be held at 133 Neville Park Blvd. on Nov. 5 and 6, 6 p.m. to 9 p.m.; Nov. 7 and 8, 10 a.m. to 6 p.m. Well-known Beach artist, Elizabeth Berry, will be holding her annual Open House and Art Show and Sale, Nov. 5 through 8 at her home studio at 133 Neville Park Blvd. This show is always one of the more highly anticipated art events of the season, as Elizabeth opens her beautiful home to the public, with a wonderful display of recent paintings. This year Berry has a number of recent paintings of local Beach scenes – familiar landmarks rendered in her inimitable style. 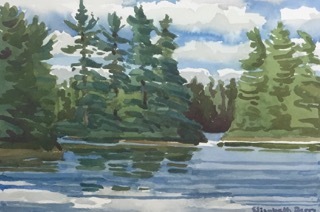 As well Elizabeth has been painting scenes from her travels in New England, Lake Rosseau, Lake Joseph, Georgian Bay, and the Lake of Bays. You can see most of these images on her website at www.elizabethberry.com. Show hours are Thursday and Friday from 6 to 9 p.m., and Saturday and Sunday from 10 a.m. to 6 p.m. There will be two preview weekends for people to come early and beat the rush. They will be Oct. 24 and 25, as well as Oct. 31 to Nov. 1. For more information visit her website, or call Elizabeth Berry at 416-698-0295. Originally a teacher and book editor, Berry had always had an interest in painting and drawing. After taking an art course, she participated in the Toronto Outdoor Exhibition in 1982, and won an award for her watercolour. Since then Berry has lived the life of a true artist, painting from an easel, on location, in places like Algonquin Park, the Caribbean, Venice and the Greek Islands. She recalls visiting Paris to paint and, due to a hotel room shortage, staying in a drafty garret, riding a bicycle around town and wearing a beret –to ward off the cold snap the city was experiencing. Her paintings hang anywhere from private homes to corporate boardrooms. Many she has donated to hospitals, or to charities to assist in fundraising. For more information, or to see more of this prolific, award-winning artist’s work, visit her website at www.elizabethberry.com. It seems only appropriate that among the 150 watercolours Elizabeth Berry will show at her annual exhibition this weekend are a number of paintings of doorways . Berry, after all, has spent the past 30 years stepping into the unknown and finding herself exactly where she should be. The next step for Berry was a period of study at the Ontario College of Art, which “gave me all sorts of confidence,” she says. Teachers praised her brucshwork, in particular, and made her feel as though “I had something special,” says Berry, now 58. Berry’s subjects, usually conveyed in watercolours, vary greatly — English country gardens, Northern Ontario landscapes, West Indian schoolchildren and, more recently, doorways in Charleston, South Carolina. The through line to all these works is a willingness to embrace serendipity. 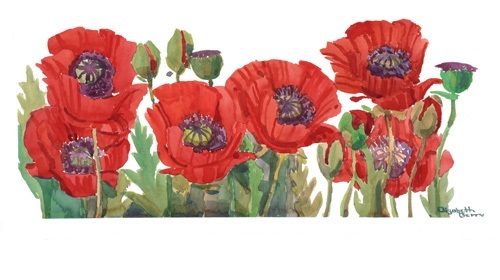 She [Elizabeth Berry] loves to travel and has combined that love with art to create a collection of lush watercolours. Her work hangs in private and corporate galleries around the world. “This is a doorway in Bayfield that I love to paint — in June surrounded by poppies and September with vines and morning glories. The door, with its elliptical fan, belongs to an 1858 Regency cottage, built of local yellow brick like many of the houses in Huron County, especially in Egmondville. Somehow, these old houses with their vines and shadowed doorways bring back the spirits of the families who once lived here. These families, with their bonnets, beautiful long gowns and handsome attire, exist now only in old photographs. My own Dutch ancestors, the Van Egmonds, were one of these families. For Elizabeth Berry, the road to stardom began at the Toronto Outdoor Art Exhibition, mounted annually at Nathan Philips Square. There, in 1986, she was discovered by poster queen Esther Cohen, who quickly saw her potential. The road led into a flower-filled distance. Elizabeth Berry drove on, watercolour box at her side. The field of poppies in Southern Ontario stretched almost as far as the eye could see, and the artists, who had a love of gardens, was determined to find the best vantage point for capturing the joy and the vitality of the scene in front of her. And capture it she did. Today, from a sunlit wall in Berry’s dining room, the exuberantly colourful painting beckons the viewer with a sense of promise. What might lie beyond that green horizon? Despite the obvious allure of foreign countries, Berry is continually drawn to the land of her family’s ancestral home – the area around Egmondville, along the shores of Lake Huron near Goderich, Ontario. When scouting for subjects, Berry may see an attractive garden or doorway and then ask permission of the owners to paint. The delights of painting nineteenth-century buildings and gardens in the picture-postcard village are augmented by the pleasures of encountering people who have known her family – reminiscences sometimes go back seventy years or more. Berry is the old-fashioned romantic artist we all picture. A free spirit, who works alone for long periods of time, Berry sets up her easel and watercolours on the street in all kinds of weather and finishes a picture on location. Last spring, Berry flew to Holland for the tulip season. Every day she braved the elements, determined to capture on paper the tulip fields before their demise. Working on location has its hazards, of course: there’s rain, which can ruin a painting (it also occasionally helps, says Berry, “giving an interesting dabbled effect)”; wind, which has carried away Berry’s paper, pushed over her easel, and sent her large umbrella skittering into a lake; and cold, in which the artists ends up “pushing ice around” on the paper.